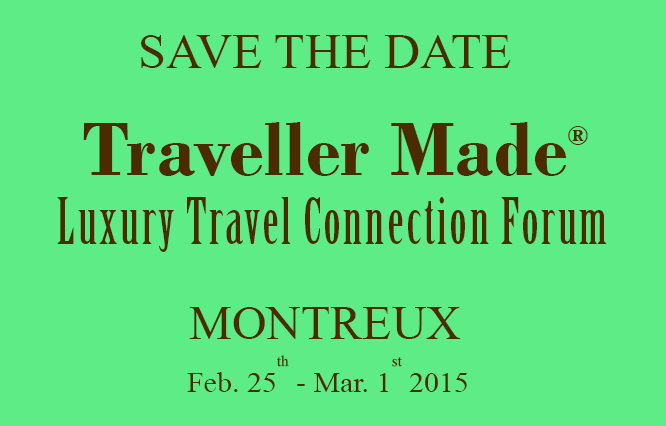 Traveller Made® announced that its 1st “Luxury Travel Connection Forum” will take place in Montreux, Switzerland, in 2015 from Wednesday 25th February to Sunday 1st March. The Luxury Travel Connection Forum will be the first event assembling Bespoke and Luxury Member Agencies accredited by Traveller Made® and Travel Partners such as the most wonderful Hotels, the best Destination Management Companies, some of the most reputed Airlines and a few of the most symbolic destinations for high end tourism worldwide. This professional event will exclusively gather together existing Members and Partners who have joined the Traveller Made® Network by invitation only. “Montreux is an emblematic destination of past, present and future luxury. We are extremely happy to host our community, for this first yearly event, in the heart of Swiss Riviera” reported Quentin Desurmont, President of Traveller Made®. He added “The agreement was fast concluded with Fairmont Montreux Palace and Montreux-Vevey Tourism because bringing the elite of the European Travel Design industry was self-evident”. “FRHI Group is already a very active Partner of Traveller Made®, so it was quite logical for us to host this new European event at the Pearl of the Swiss Riviera where we already host some of the most influential world class travellers,” said Karim El-Rami, Director of Sales & Marketing at the Fairmont Le Montreux Palace. “Montreux has reached an international position as a key event destination with such high caliber happenings as the Jazz Festival, Comedy Festival, Montreux Grand Prix and Montreux Art Gallery, to mention a few. These events, jointly with the international reach of Montreux on the international geopolitical scenery, make it an “unavoidable” luxury destination. We are proud to welcome all Members and Partners of Traveller Made® the last week of February 2015,” Announced Christoph Sturny, Director of Montreux-Vevey Tourism. Pre-registration for the Luxury Travel Connection Forum will open on Tuesday 29th April 2014.